After Gong Sun Zan's discard phase, he can place any number of cards on his character card. These cards are Subordinates. He gets a bonus +1 for each Subordinate. At the beginning of his turn, Gong Sun Zan discards all Subordinates. If he discards less than three, he draws one card. For the rest of his turn, Gong Sun Zan gains a bonus -1 for each Subordinate that he discarded. Gong Sun Zan can discard both and cards and equipment for "Follower of Virtue". "Follower of Virtue" takes place after Gong Sun Zan's discard phase. He must discard before he can put down any Subordinates. 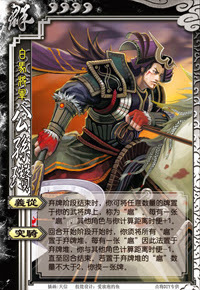 If Gong Sun Zan does not discard any Subordinates, this is less than three so he still draws a card. Gong Sun Zan must follow through with "Sudden Change". He does not have a choice in the matter.